Bringing the War to Coleman's Door! 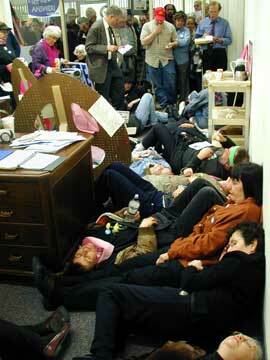 Most of the demonstrators had been in this office many times. 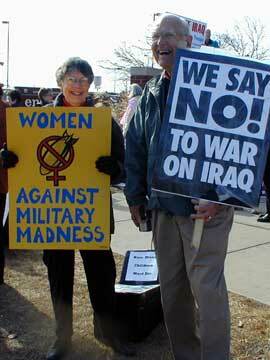 "Paul's office," they said, as they prepared Monday to stage an antiwar vigil in the Twin Cities office of Sen. Norm Coleman, the same suite of rooms previously occupied by the late Sen. Paul Wellstone and his staff. "Can you believe it," muttered one of the demonstrators. "They moved into Paul's office and didn't even change the phone number." Most of the people in this crowd had loved Wellstone. But they had fought with him, too. Sometimes passionately. For example, only a few months ago, Marie Braun, who organized Monday's takeover of the Coleman office, was sleeping on the floor of Wellstone's office. "We stayed for three nights," she recalled of that vigil. "Fortunately, someone brought in one of those blow-up mattresses, so it was pretty comfortable." 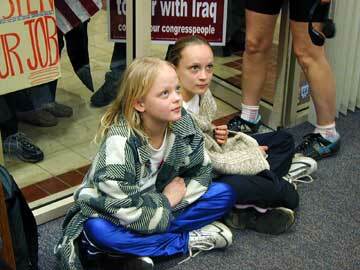 At the time, Wellstone had not made his position clear on the looming invasion of Iraq. The peace people, some of Wellstone's earliest supporters, were pushing him as hard as they could to come out against a war. "He wasn't happy with us," Braun said. "But in the end, he voted right. . . . Even when we disagreed with him, we loved him. I think he loved us, too." No such love is ever likely to bloom between Coleman and the peace people. The takeover of Coleman's office was what's known as a futile gesture, though there was irony in it. 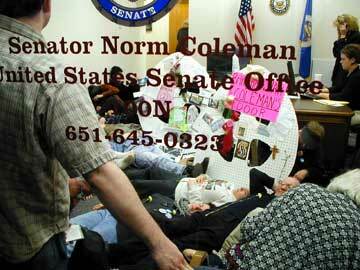 The irony: Once upon a time, Coleman was like the people who took over his office Monday. As a collegian, he was a leader of protests against the Vietnam War. He has cut his hair, bought nice suits and changed his politics since then. Few embrace this war more enthusiastically than Coleman. "I think it makes a difference that we're here," Braun said. "If you believe in peace, you can never give up hope. We'll keep up the pressure." About 80 people entered the building where Coleman's office is located. 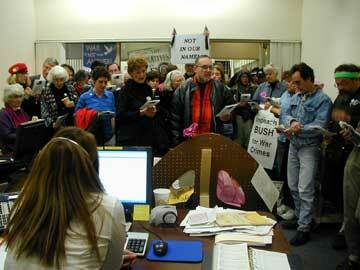 About 40 of them squeezed into the annex of the office itself. For an hour, they sang. They read from newspaper articles about the human destruction created by "smart bombs." They shared prayers and recited a non-violence creed. 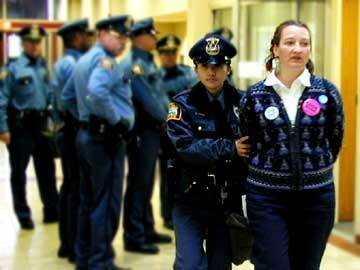 Then Braun announced that she and a couple of dozen others were going to stage "a die-in." 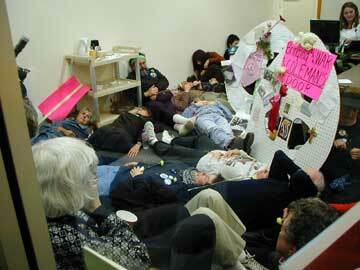 They would lie on the floor of the annex, making it difficult for anyone to leave or enter. 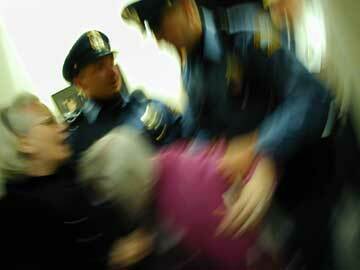 "If you don't plan to get arrested today, you should leave now," Braun said. Many left as Braun and others stretched out on the floor. 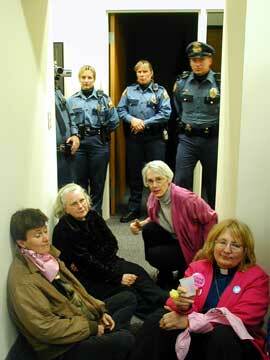 Here, then, was the situation: The demonstrators were on the floor, hoping to be arrested. Coleman's staff was hoping this problem could be resolved with no one being arrested. At about 3:30, or 90 minutes into the standoff, most of the Coleman staffers were sent home. But their departure left the Coleman switchboard in the hands of the demonstrators, which gave these very serious people a few minutes of giddiness. 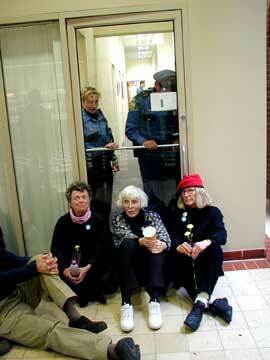 When the phone rang, demonstrator Rachel Goligoski answered courteously: "This is Senator Coleman's office. The senator's staff has gone home for the day. 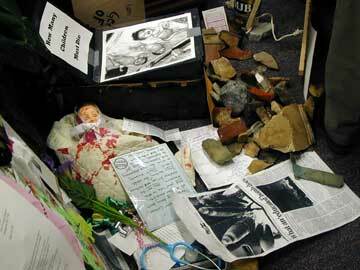 His office has been taken over by peace activists." At one point, Goligoski called the White House comment line from Coleman's switchboard. "I told the man who answered that I was calling from Senator Coleman's office and that it had been taken over by people who want peace," Goligoski said. "He wanted to hang up, but I said, 'Just a minute, some other people want to say something.' I yelled, 'What do we want?' And they [the demonstrators] said, 'Peace!' And I said, 'When do we want it?' 'Now!' "
The White House person ended the conversation. 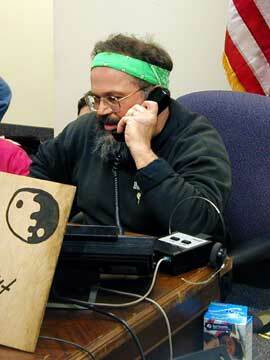 Coleman's office manager took the phone receivers from the switchboard. 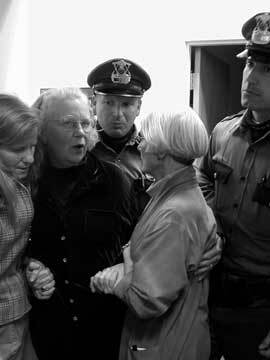 The demonstrators started sharing their somber thoughts of war again -- as they waited for arrest. In the end, the demonstrators had to force the issue, pushing up against St. Paul police who asked them if they wanted to be arrested. Twenty-eight said they did. Those arrested were taken to a conference room near Coleman's office. 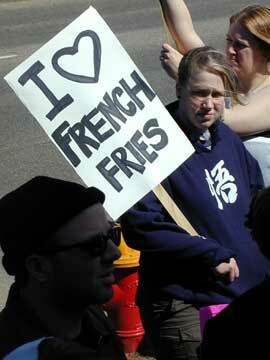 It, too, was a familiar place to many of the demonstrators. They'd once had an angry meeting with Wellstone in that very room.